Originally released as a limited edition of 300 vinyl copies back in 1990 ‘Advent’ soon became a huge critical success, being snapped up for a re-issue by the influential Table of the Elements label and written up by Alan Licht in his ‘minimal top ten’ list. Now available again, we can honestly say that it sounds as fresh and involving now as it ever has done. Some of you might know Youngs from his recent work with Jandek (it was him playing bass in the UK shows) or his continuous folk-tinged solo alubms on the JagJaguwar imprint, but ‘Advent’ is the real jewel in his compositional crown. Built around recordings he made in three days in 1988; the guitars on one day, the piano the next and the oboe and voice on the next day, the track is in three parts; the first taking the simple looping piano and then as each part progresses a new element is added until we reach the distorted cacophony of Part III. 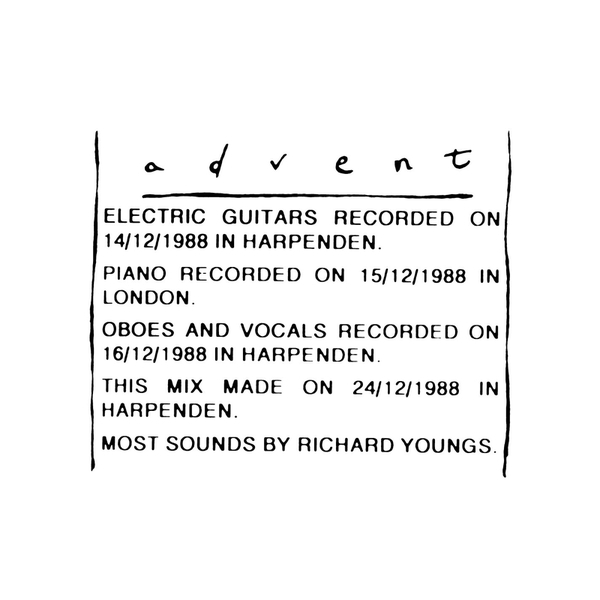 Alan Licht may have been gushing when he placed ‘Advent’ in the top 10 minimal records of all time, but this truly is an important piece of British avant-garde music produced by one of our underground treasures. Highly recommended.